You’ve found the BEST tree lot in the Metro! 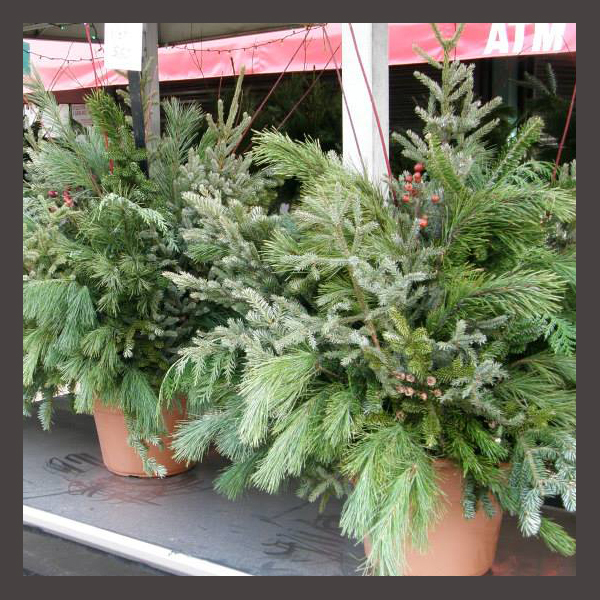 We have an amazing selection of fresh cut Fir, Spruce, and Pine Christmas trees. But our Tree Lot is MUCH more than just trees. We have freshly made fraser wreaths, ropes of garland, and beautiful patio pots. Want to make your own holiday arrangements? We feature an awesome selection of fresh boughs, bundles of spruce tops, and accents such as magnolia, winterberry and so much more. If you’re one of our regular customers, welcome back! If you haven’t shopped the Annex over the holiday season before, come see what you’ve been missing! 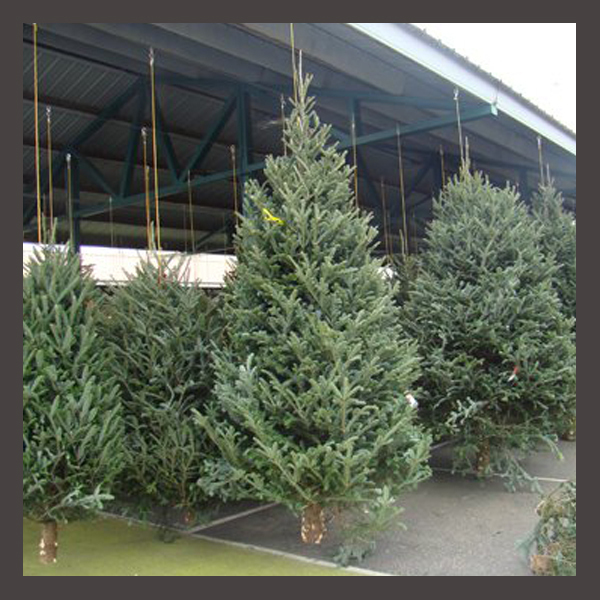 There are hundreds of evergreen trees in every size, shape, and variety you could ever want! Our partners at B & J Trees pride themselves in harvesting only the highest quality trees for your home. From classics like a Fraser Fir or White Pine to the unusual like a Korean Fir, we promise that you won’t find a better selection of Christmas trees in town. Come down and see our unbelievable selection for yourself! Learn more about all our trees! We take great pride here at the Annex in making our own wreaths, garland and swags. We use only Fraser Fir boughs for our wreaths, giving you a fuller, and firmer wreath than a Balsam wreath. They come in a variety of sizes from 24” to 60”. 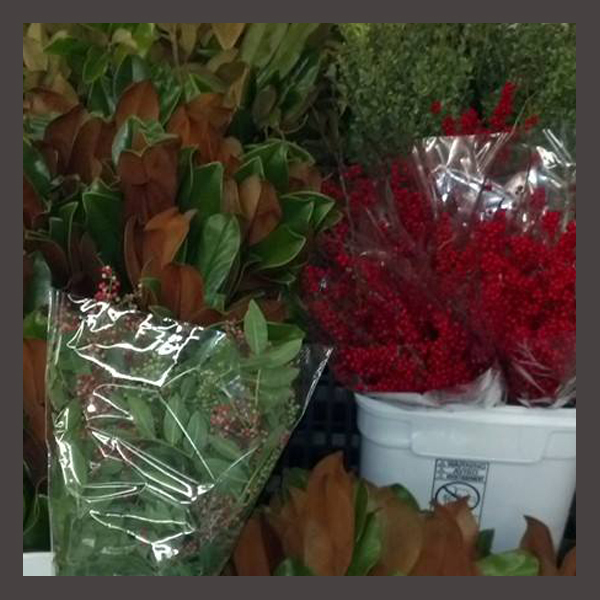 We even have specialty wreaths like Magnolia and Juniper. Our garland is perfect for both indoors or outdoors. Our Balsam and Fraser ropes are 25’ long and made in house! You’ll also find other greens, like Pine, out on the lot as well. Also out on our lot are our door swags. A wonderful mix of Noble Fir, White Pine, Juniper, and Winterberry. Once you see our premium quality wreaths, garlands and swags, made right here, you won’t go anywhere else to buy one again. 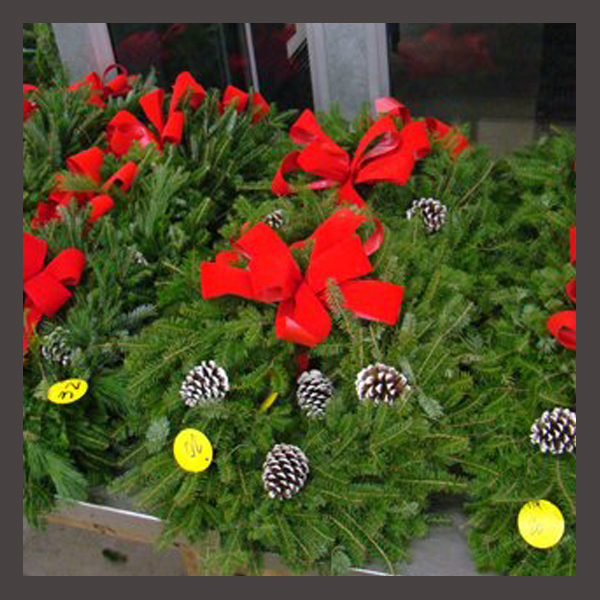 Learn more about all our wreaths, garlands & swags! We build our own patio pots on site to give you the fullest and freshest pots you’ll find. Other nurseries and greenhouses don’t hold a candle to the quality and quantity you get with our patio pots! They are filled with a wonderful mix of greens, rose hips and dogwood which will keep the outside of your house looking fabulous well after the holidays. Want just spruce tops? No problem! We sell bundles of Spruce Tops in two different sizes. We get them in fresh all holiday season and keep them sheltered so you aren’t chipping them out of snow. Make your own, or let us do it for you, your pots will look fantastic this holiday season! Learn more about all our pots and spruce tops! Everyone knows about the awesome bulk flowers you can buy every summer from Market Flowers. Well now picture that, only with boughs, berries, branches, and more. We stock boughs of Fraser Fir, Cedar, White Pine, Scotch Pine, Noble Fir, Juniper, Incense Cedar, and many, many other greens. Looking for something other than evergreens? We carry Magnolia, Winterberry, Eucalyptus, Rose Hips and much more. Don’t forget dogwood branches and birch trees and logs. We have them all season too! Learn more about all our boughs, berries and branches! Much like Market Flowers, the Farmers Market Annex also takes pre-books on much of our selection. Call or stop in, and with at least two weeks notice and a deposit, we can have your order ready for you. This includes wreaths, pots, boughs, berries, garland and more! Check out our Christmas Pre-Book List to see everything available for pre-booking!